The Golden Hill Community Garden believes everyone benefits from having the opportunity to grow their own food. 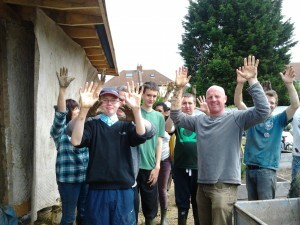 We are based in Horfield/Bishopston Bristol and aim to increase the skills and confidence of local people in growing food through volunteering and training. We provide an inclusive and accessible space and supportive atmosphere where everyone feels valued and also promote healthy food and healthy activity. We welcome everyone to come and get involved and especially welcome volunteers with physical and/or mental ill health or impairments, people with learning difficulties as well as children and young people with appropriate support. We hope that everyone can join in with food growing, taking up learning opportunities, and experiencing the restorative enjoyment of being in an outdoor natural environment. The site uses organic methods and aims to encourage a diversity of wildlife. The Golden Hill Community Garden recognizes the value and importance of volunteering. We value diversity and the range wide of skills and perspectives a diverse group of volunteers can bring. We believe that the garden benefits from having a range of volunteers just as volunteering and gardening benefits individuals. We also aim to financially sustainable through social enterprise.